Originally from Limoges, France, Julie Desbordes is a fast rising conductor known for her engaging style, energetic interpretations and emotional communication with her musicians and audiences. Currently Artistic Director of QUO (the Queer Urban Orchestra) in New York City, her recent international appearances as a guest conductor include concerts in Venezuela, Canada, Hong Kong, and Macau. 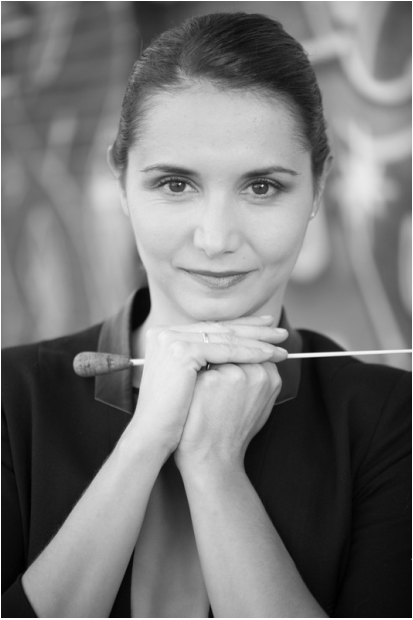 She is also Associate Conductor of Education and Outreach for The Chelsea Symphony (NYC). Ms. Desbordes has a special passion for educational outreach, and is known for creating interesting programs that bring a wider and more diverse audience into concert halls. She served for many years as Site Director and Orchestra Director for New York’s Harmony Program (El Sistema USA), and in this capacity was named “New Yorker of The Week” by Columbia University. She was one of two finalists for the Directorship of the Los Angeles Philharmonic’s El Sistema Youth Orchestra program (YOLA), and has been a featured guest at El Sistema programs nationwide, most recently in Los Angeles, Baltimore, Hawaii and Connecticut. Julie is featured in an upcoming documentary about El Sistema USA by Jamie Bernstein (daughter of Leonard Bernstein) entitled Crescendo! The Power of Music, to be released on Netflix in 2015. She also has been noted in El Sistema pieces by PBS, ABC, and CBS. Julie’s love for music began from the moment she picked up the cornet at age eight in her native France. Soon after, she was identified as a talent with the baton as well. She was named Co-Director of the Harmonie Municipale de Limoges at the age of twenty-one. Ms. Desbordes holds multiple degrees in both conducting and trumpet from each of the following: Conservatoire de Musique Limoges, Conservatoire de Musique Bordeaux, and Conservatoire de Musique Montréal. Her conducting teachers include Raffi Armenian and Gustav Meier. She resides in New York City with her husband, international trumpet soloist, Joe Burgstaller and their 5-year-old Yorkshire Terrier “Minnie”.